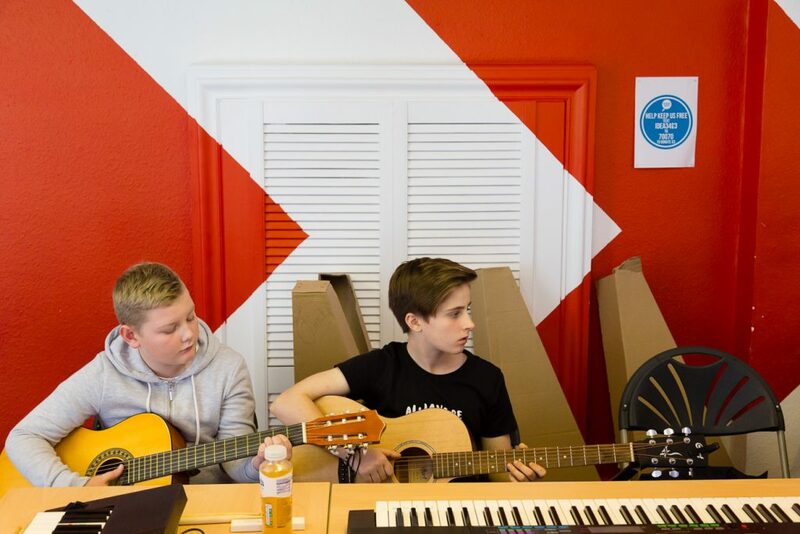 How well does Musical Futures work in youth clubs? Disquiet was a pilot project that worked with six trainee music leaders aged 16-19 at both Strood Youth Centre and Ideas Test in Sittingbourne. It set out to test if accessible teaching methods, such as Musical Futures’ Just Play and instructional YouTube videos could be adapted to effectively support music sessions for 13-15 year olds. Kevin Grist of Sparked Echo and Disquiet Project Manager reflects on the programme. 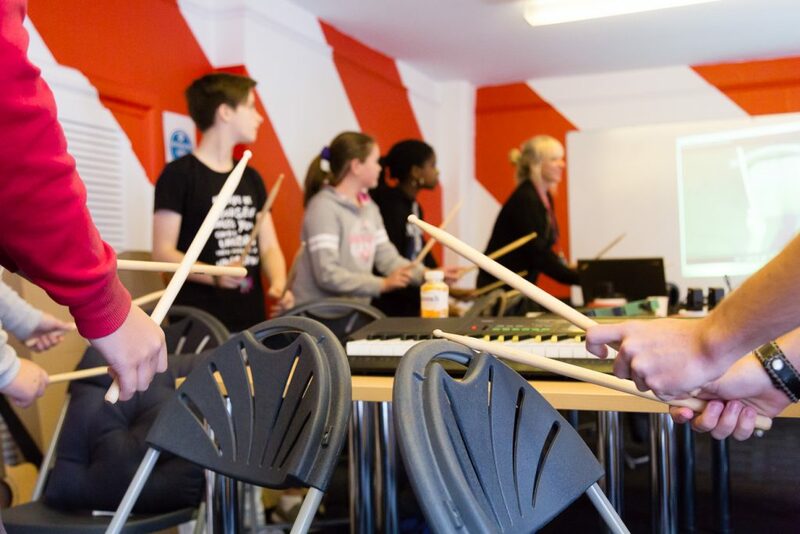 When SparkedEcho were asked to manage Disquiet – a pilot project to help young people run their own music clubs using the Musical Futures teaching approach – I naturally couldn’t wait for us to put it to the test. The project involved supporting 7 young music leaders from Strood and Sittingbourne aged 16-19 to run a series of music sessions in 2017 to participants who were slightly younger. It was funded by Youth Music. How would we train teenagers to deliver the Musical Futures approach to their younger peers? 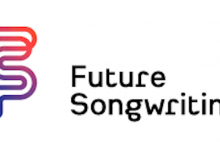 How appropriate would the Musical Futures teaching resources be for the younger participants and indeed the music leaders? We were going to be working in Strood Youth Centre and the Ideas Test community arts venue No. 34 in Sittingbourne – both in areas of disadvantage. The venues had different facilities – a communal hall and recording studio at the youth centre, and a shop floor exhibition space and classroom style rooms at No 34. Half of the young music leaders recruited had played an instrument before. Amongst the group were SEND needs and experiences of poor mental health. Youth staff from both sites would also be trained so they could provide ongoing support – some of these were experienced musicians. practical training days – to gain basic instrument playing skills and techniques, to try out the Musical Futures approach from a learner perspective, get ideas for music warmups and games, and how to use the ‘play-along’ resources. This was adapted from the Musical Futures ‘Introduction,’ ‘Just Play’ and ‘Compose and Improvise’ training. regular observation and coaching – to develop leadership skills including behaviour management, session planning, checking learner progress and considering access. Observation and coaching were to be done using the Youth Music Quality Framework. After the first practical training day, the music leaders would start to run their weekly sessions with support from a youth worker. As the coach, I attended the first 2 sessions to also help everyone ease in. After that, the observations and coaching happened every fortnight, with 2 further practical training days scheduled in the first 3 months. In total, each group ran their music club for 12 weeks during the spring and autumn of 2017, with a summer break. The practical training days appeared to transcribe well for young people, with lots of opportunities to try out playing instruments and rhythms (videos), warmer activities and to build confidence. 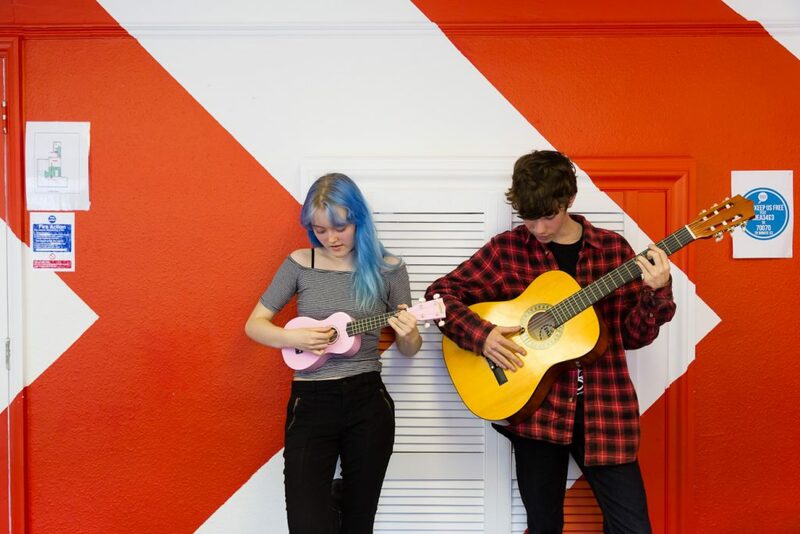 The first ‘Introduction’ session was pitched at an entry level and covered core aspects of the Musical Futures Just Play approach with suggestions on session structure, considering the space, and learning basic ukulele, guitar, keyboards, drums and bass. The idea was to equip the leaders with basic skills and give them some videos to take away on a data-stick, so that they could make a start with their sessions. The second training day focused more on how to use the Just Play play-along videos in a workshop setting, developing techniques in leading, and adding in third party online resources (how we chose the right resources and repertoire is discussed below). The idea was to introduce videos that were fun, easy to understand and read, but still used an element of basic music notation, chords and tabs. We wanted the music leaders to feel excited and confident about these in their sessions and planning. Many trainees commented on how relieved they were to have the videos there to act as a teaching aid and help to conduct the timing at this early stage in their development. The third and final training day was on ‘Composing and Improvising’ and this challenged music leaders to facilitate song writing and spontaneous music-making, away from using set repertoire. It covered activity ideas to encourage their groups to write lyrics, use technology to layer recordings, and jam music parts in a loop or groove. The more musically-confident trainees appeared genuinely keen to try these activities in their group. For all, it meant they could offer a creative activity alongside the play-along element, making for a more-rounded session. The regular observation and coaching provided an opportunity at the end of some sessions, for me and the trainees to reflect. On the sessions I was there, I would demonstrate by leading the session for 20 minutes, so they could see my approach. During the coaching we used a set structure of what worked well, what could be developed, and what will be done next time (goals). The trainees appeared to find this personalised feedback both daunting and extremely useful. It was particularly powerful when the young people were setting their own development goals. I would record these on a pro forma, email it to them and post it onto a private blog, where I would also add photos and video from the session as a reminder. The young trainees could have benefitted from a longer lead-in time to learn instruments before undertaking the training. It was a steep learning curve for many. I would have liked to have trialled a longer period for the music leaders to shadow a music teacher or to have built it into every session for the first 20 minutes. More interrogation of session planning to get music leaders to think about musical progression for their participants. This was touched on the coaching, but the sessions were largely instructional and based around the play along videos. This isn’t surprising as the music leaders were completely new to teaching and were still developing leadership skills. Thinking about informal music resources, I already knew it was an open and often crowded market. Young people were regularly accessing YouTube, Chordify and other ‘play-along’ resources at home to learn their favourite songs. The choice, when I looked, was impressive. You could get anything from chart music and indie B-sides to film scores and video game idents. The caution with open market resources is that amongst the good stuff, there is an awful lot of bad stuff. The accuracy of the content cannot not be guaranteed, and many are interpreted with the wrong tabs, chords or lyrics. I do sympathise with this crowdsourced approach to some extent. I trained by ear and transcribe music a lot, but it takes time and experience to transcribe music well. Ultimately, the learner is likely to be at a disadvantage if they do not have the correct material to hand from the start. Licensing is another issue and particularly on YouTube. Once copyright infringement has been reported, videos often disappear and are therefore not sustainable. Resources that are available to buy legally, such as through karaoke-version or Musicroom, do not appeal as much to young people where the barrier is, of course, money. This is where resources like Musical Futures have an edge and perhaps some longevity. As mentioned, Musical Futures is primarily a teaching approach with a growing bank of resources that support it. Some of those resources are free to access while others are available at a small cost to a school or youth club. ‘play-along’ – with chord, rhythm and lyric information, which allows for voice, drums, keys, bass, guitar and ukulele to be played together. technique – instructional and provides clear progression – chair drumming, changing chords, rhythms, improvising and fret noodling. warmers/games – these are crowdsourced by their community of teachers, who share hand-held style videos of their activity idea in action. printed materials – chord/lyric sheets, some of which are also crowdsourced by teachers, and keyboard sliders to help identify notes and chords. You would ideally need to have some understanding of the approach, but you could, in theory, use the resources in their own right. For Disquiet, this was key in ensuring that young music leaders who joined the project and missed the training on offer could still participate. We decided to ask the music leaders to look through and choose which of the Musical Futures Just Play resources they would like to use in their teaching. They chose around 20 contemporary pop and older pop songs ranging from Ed Sheeran’s “Shape of You” to Bob Marley’s “Three Little Birds”. 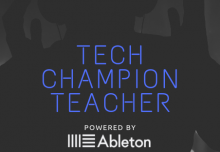 Alongside this, they wanted their learners to have keyboard sliders, and use the technique videos on chair drumming, rhythm and strumming patterns. 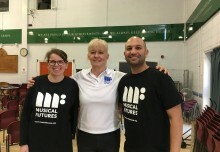 The Musical Futures resources and approach were very adaptable. 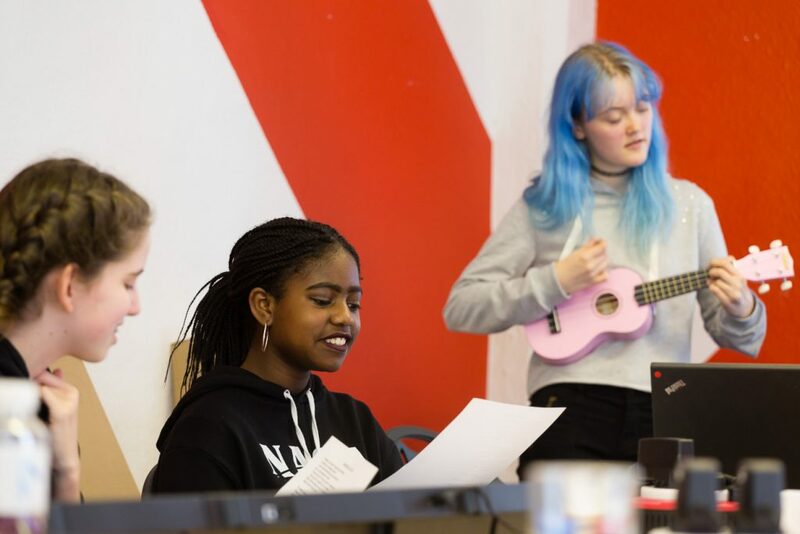 As young people started their sessions, they began to introduce their own ideas about where to stop and start the videos, add or take out instrument parts and change the order of the lyrics. They were also able to bring in third party resources and the very latest chart songs, which they felt comfortable using alongside Musical Futures. In the end, as the music leaders evolved, they opted for a happy medium of ‘instant’ karaoke songs on sites like YouTube that they could learn in between sessions at home, and the depth and quality of Musical Futures resource to undertake in the sessions. There was also some basic recording on mobiles phones and sequencers so that the performances in the sessions could be captured and shared. It wasn’t pure Musical Futures, but a youth-led adaption of it. In terms of resources and tech, they were using YouTube, Chordify, Guitar Tab, A-Z Lyrics, Little Kids Rock, voice recorders, video cameras, a projector, GarageBand, Logic and Soundtrap. Alongside this, they found the low-cost keyboard chord cards and using chairs for drumming, easy to reproduce at home. This combination of Musical Futures and non-MF appeared to work well and provided a mixture of challenge, fun, familiarity and high engagement. Observing this was fascinating and provided strong rationale for how the video channel was designed at the end of the project. Have a suggested list of reputable third-party websites and resources to ensure young leaders are supported in identifying reliable and high-quality material. After the project, the Disquiet Video Channel was co-created with some of the music leaders and participants who had taken part. It was designed with other young people in mind, and something that could be used in other youth clubs or classrooms, with or without teachers and youth workers. As of writing, the Disquiet Video Channel is due to be launched publicly soon. We will be keen to analyse how it is used over the coming months and to receive feedback. 1. Musical Futures could build on, scale up and develop an in-depth Musical Leader Training Programme. It would have to have the rigour of the pedagogical approach, but the flexibility to be adapted and meet young people where they are at. This includes to use a range of other tech, resources and community spaces. It could be linked to Arts Award or Community Music Education training if appropriate. It could also be delivered with youth workers and teachers present to have a support mechanism post-training. 2. Musical Futures could use some of the Disquiet Video Channel as a resource for their existing teacher training. This could help teachers better understand young people’s perspective and interests, and to promote the need for a bigger youth voice in music education. 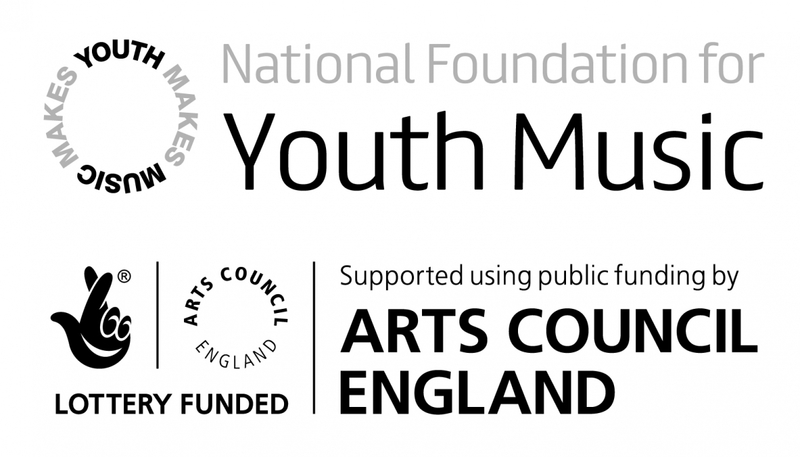 Disquiet was supported by funding from Youth Music. Kent Music kindly continued to facilitate the project at Ideas Test, Sittingbourne, beyond the funding period.